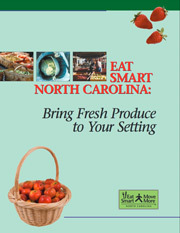 Eat Smart North Carolina: Bring Fresh Produce to Your Setting is a planning and resource tool for anyone who would like to have fruits and vegetables, especially locally grown, available to buy in their worksite, place of worship, neighborhood or at any gathering place. The guide provides practical information on developing a partnership with a local farmer/produce vendor to bring and sell fresh fruits and vegetables in a variety of settings. Bring Fresh Produce to Your Setting also highlights why fruit and vegetable consumption is important to the health, environment and economy of North Carolina. Whether your setting (worksite, church, community, etc) is considering starting a farmer’s or produce vendor’s market, joining a Community Supported Agriculture (CSA) or beginning a produce buying club, this guide walks you through all of these options and the steps and resources to build success.